One of my good friends from design school moved to the burbs. We promised we'd meet up once a month and have a girls night, but kids and obligations get in the way, and while we have a very healthy texting relationship...we NEVER see each other. Then, along came Ron Burgundy! We vowed to meet halfway between us and see Anchorman 2! Don't even get me started on how bad this movie was. SO bad. It was still worth it to visit with my old friend, but whooo what a stinker that film was! "btw i meant to ask u wht u have been using on ur skin ur complexion looked mahvelous!" "I'll shoot it to you in an email...all Walgreen's"
"walgreens?! ur skin looked plump, radiant, and even toned." My only mantra at my age is "you can't hydrate too much", especially in this Chicago winter. 1) Garnier Ultra-Lift Eye Cream- I like this product, it's very creamy, and when I say I am in a battle with my under eye area, I don't lie. I'm even trying to sleep on my back so I have less strain on my eye area. blech. 2) yes to cucumber soothing eye gel- I wear this in tandem with the eye lift cream. I find them together to work quite well. My under eye area feels firm and moisturized all day. Score! 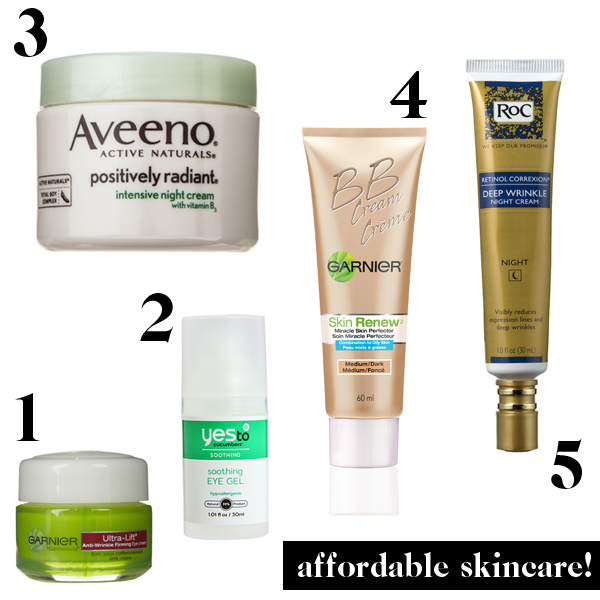 3) Aveeno positively radiant intensive night cream- I'm sure I'm breaking a rule here, but this winter, I've been wearing this in the daytime. It is so creamy, I like how smooth this goes on, and I wear it under my spf cream. 4) Garnier Skin Renew BB Cream medium/deep- Yes, I got this in a BlogHer swag bag. It has an SPF of 20, which I love, because the only place I go without sunscreen is to sleep! When I first put this on, it seemed way. to. dark. Give it a chance though, it bends in very nicely and gives my skin an nice even base.